From wild curls to the messy nest bun to the stick straight "wet" hair look, this fall's hair trends are anything but ordinary. You're going to need the tools (or dare we say 'tool') to pull them off, and we've got just the one you need. 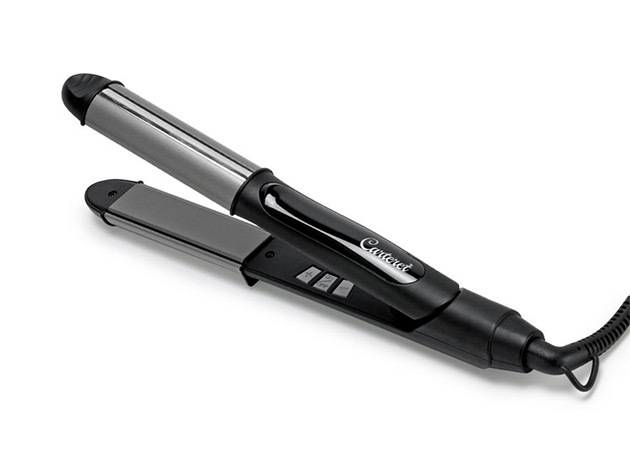 The DUOPRO Curling & Flat Iron is our new bff because it works as both a curler and a straightener. Packing for a trip? Packing for the gym? Everything is easier when you only need one hair tool. But it's perks only start with saving space: the iron is equipped with ceramic tourmaline plates that quickly heat to 450° Fahrenheit and keep your hair from frying after a ton of use. Its high temps--indicated on a LED digital temp display--leave your hair with seductive waves or super-straight strands for the whole evening. And its automatic turnoff is a must if you're always wondering whether your curling iron is still on once you've already left. This game-changing hair tool comes in black, cream and red so that it matches the rest of your styling appliances, and its two-in-one design saves space under the sink and in your luggage. That means more room for clothes on your next trip! It's currently 74% off and listed at a low $25.99, which includes free shipping to the continental US! That's a bargain for gorgeous locks all fall long.